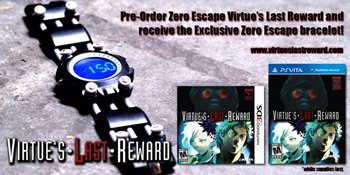 Zero Escape: Virtue's Last Reward pre-orders come with a replica death watch. If you were savvy enough to pre-order Chunsoft's 999: Nine Hours, Nine Persons, Nine Doors for the DS back in 2010, you might have got your hands on a limited edition wristwatch based on the iconic bracelets that drive the game's story. Having one of these watches is what separates the true believers from the filthy, mouth-breathing scrubs who don't pre-order obscure Japanese adventure games. Do you have one of these watches? If not, you may begin weeping silently. Fortunately, 999's kind-of-maybe sequel , Zero Escape: Virtue's Last Reward is based on a very similar premise, and, rather predictably, is coming with a fancy pre-order watch of its own. The watch, marketed as an "inoculation device" in a clever little press release from publisher, Aksys, comes with the Vita or 3DS version of the game, but only if you pre-order through Amazon. If the launch of 999 is anything to go by, supplies will be extremely limited. The press release also contained a few exciting tidbits about Virtue's Last Reward and how it ties into the previous game. Though VLR was originally announced as a spiritual successor rather than a direct sequel, this press release confirms that several 999 characters will be making an appearance in the game, Clover and Alice in particular. Considering 999 ended with a sequel hook the size of a small moon, that's no bad thing. The game is now fully voiced - in both Japanese and English, thank God - with the exception of the protagonist who is presumably doing the old-school "silent hero" thing. The game is also said to have a total of 24 endings, the majority of which, going by the previous game, will be grim. Zero Escape: Virtue's Last Reward arrives on Vita and 3DS on October 23rd.